One of the most horrific feelings a traveler can experience is the depths of disappointment when a promised "Amazing Thing' turns out to be not-so-amazing. Imagine if you will: it's a bright, sunny day. The road trip you've embarked on has been spotted with good food, good roads, and numerous quaint encounters with roadside culture. You decide to cap your day in a big way, a visit to the World's Largest Peanut. You've circled your map, and head into a promising Small Town that Thinks Big. 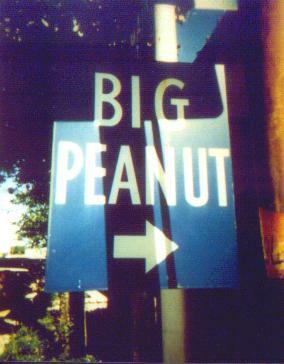 You spot a tell-tale blue sign with the words "Big Peanut" and an arrow, directing you into the heart of town. You pull up to a vacant parking space, in front of the courthouse. And there you find the World's Largest Peanut. Only it's not so large - in fact, you know you, yourself, or even your teenaged son could build a bigger one. You're so disappointed, in fact, you don't even take a picture. From there on out, the pies at the diners don't taste so home-made, the scenic vistas not as pretty as you had hoped. Yes, one disappointing World's Largest can spoil a whole trip. On that note, you can pass up Durant Oklahoma's claim of Largeness, and drive on over to a much more satisfying Georgia peanut. The ten foot tall Goober Goliath, perched on top of a fifteen foot high stack, hovering above a crown proclaiming its rightful status, puts the puny three foot peanut previously lampooned to shame. The Ashburn peanut proclaims "Georgia - 1st in Peanuts", built to celebrate the area's peanut processors. It was built (according to the Chamber of Commerce) by an Ashburn Citizen, proving that it just takes one person with an idea to create an icon for a town. There are other worthy, although less lengthy, peanuts that also tromp the Oklahoma option - Persall Texas has a six footer, and Plains Georgia has a peanut with a Jimmy Carter grin. All in all, the towns aren't nuts - Peanuts are legumes, not nuts, so the populations of these peanut paradises are (technically) off the hook.